What about South San Diego Bay? South San Diego Bay. click on image for larger view. Hidden in the center of San Diego though clearly visible on every map; ignored yet fought over all at the same time, this is South San Diego Bay. This water front property, a valuable and rare commodity on the California coast, is only an occasional after thought – a place we can’t quite figure out what to do with. It may be in the center of maps, but it’s hard to find on political agendas. Should we fill it in to create another airport? Use the bay as scenery for a football stadium or Convention center. A few years back the Navy thought nothing more of the area than for a place to put their unwanted dredge spoil, the mud from the bottom scooped up to make channels for their ships deeper. Decades ago competing visions arm wrestled over the area. One side saw an industrial harbor for commercial shipping, the other side saw a tourist destination. Four times the idea of a second entrance for large ships was studied, spurred on by a casual comment from then Secretary of the Navy Franklin D. Roosevelt that a second entrance might serve the Navy well. That was in 1919. But in the end south San Diego bay became home to salt ponds that produce low grade industrial salt and a now aged power plant. For the last 100 years San Diego Bay has been remade but not in any one image. The three rivers that once flowed year round into the bay were damned, as were the six creeks. With no fresh water to help flush the South Bay salinity increased. And when the Otay and Sweetwater damns burst in 1916 the south end of the bay went from 8 feet deep to 4 feet deep in a matter of a week. For decades derelict boats were left to rust and rot in the bay’s outback. The residue of those years still lingers; in 1998 NOAA identified San Diego Bay as the second most polluted bay in the United States. In response, Congress drew a circle around the least used but worst polluted section of the south bay and called it a natural preserve. The clean up, in any, would be left to a future generation. Today the area is locked up in a jurisdictional tug of war. Twenty-two federal, state and local agencies have some say over what happens in the South Bay. The City of Chula Vista, together with the Unified Port District just spent the last five years on a plan for their bay front. That redevelopment effort recently collapse when Gaylord, the developer, walked away. In the void another idea was floated – fill in the south bay to build Lindbergh Field’s replacement. As we look at the airport, stadium, convention center, mud island alternatives the one idea that is missing is the idea to actually using South San Diego bay as, well, a bay. Given the needs of the region can we really just continue to ignore the potential of the south bay? And given the fact that bays on the west coast are in seriously short supply, why would anyone suggest filling it in or as an aquatic landfill with no more value than as a place to dump toxic dredge spoil. There is a better vision, a vision that sees the south San Diego Bay as one place, an eco-system, an environment, an estuary and delta, a vision that see the value of a small second entrance at Emory Cove; to flush the bay and cleanse the waters, provide access for small boats, to rebuild a natural estuary, and provide productive employment for thousands of people, to take hold of our economic future. And 20 years from now we would like what we created. There is a better plan. So why not? If this is such a good idea, what’s holding it up? I don’t think I have any special insight or wisdom. A surfer, a sailor, I spend a lot of time on the water. I talk to others like myself and to those who have studied the bay, and San Diego bay has been thoroughly studied; over 2,500 environmental studies of San Diego bay have been done in the last 35 years. So why hasn’t this idea been tried before? One reason could be because the vision lacks a champion, other than me, of course; an organization with the power and clout to get it done. It could be the fact the vision cuts across jurisdictions, all 22 of them. Those agencies are in place to maintain the status quo. We can do better than the status quo. Must we accept the results the south bay’s chaotic history; industrial salt ponds, aged power plant, and shallow waters that help to hide the toxic landfill that lies below the surface. Jon, this is a great vision. I hope you share with us more of your ideas that I know you developed in the early part of this decade about the South Bay. Hey, let’s start right now and upgrade our perception of the aquatic area by capitalizing the “S” and “B” for “South Bay”. Oh, by the way, when was the last time you cradled a surfboard under your arm? Jon this is an awesome piece! Great questions/options being posed still make me really wonder if, with so many different entities involved, will anything productive ever transpose down there. I also love the idea of a second southern inlet to circulate the bay’s water. On a (sort of) side note, I heard that there’s munitions placed within the Silver Strand to blow a hole open big enough for our ships to be able to deploy quicker from the bay if we’re attacked. Part of me thinks it’s possible but the other part thinks it’s probably an urban legend. Thanks for the comment. True, the many agencies have neutralized each other for decades – for the South end of San Diego Bay there is no consolidated planning. For the vision to work, people like yourself must support it, promote it. The NWR could not be a more cynical creation – “let’s protect our toxic dump for the wildlife” – good idea, not. On blowing a hole, not likely. Navy capital ships (the big ones)take 30-40 feet of water; a channel must be dug off shore perhaps 600 – 800 yards. Truth is most Navy bases have on one harbor access – think Pearl Harbor, San Fransisco; curiously the only multi access harbor in the area, Long Beach, the Navy closed. Not a priority for the Navy. I always thought the end of the Emory Channel should be opened up. And yeah, it’d probably take 20 years at this point for the sediments to clean up. A small channel like the Mission Bay channel that would allow most private craft and sport boats to use. They could charge and annual usage fee the help pay for it in the long run. I felt that a break-wall with culverts installed could extend inward from the new south jetty to separate the marsh from the main bay, yet allow water flow and wildlife travel. 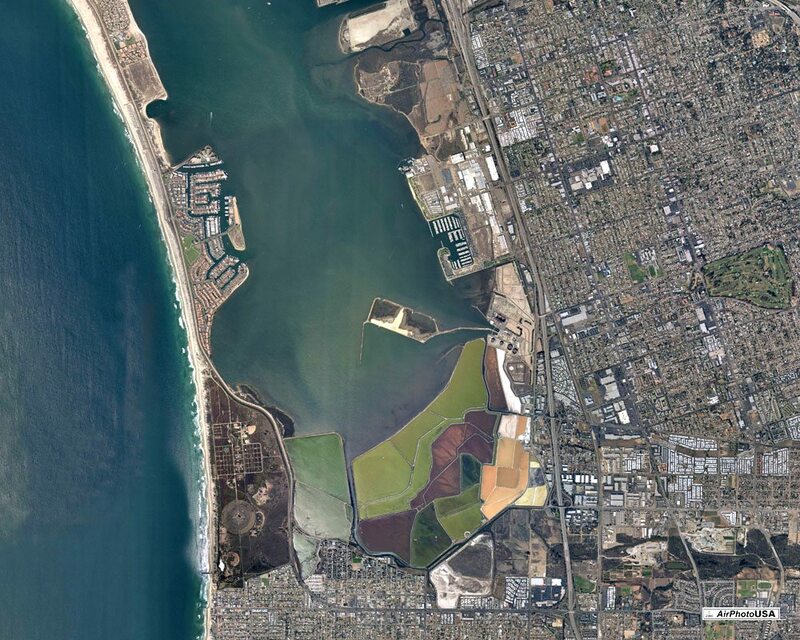 The remainder of the main south bay could then be dredged to 8′ at zero tide and 15′ in Emory Channel.